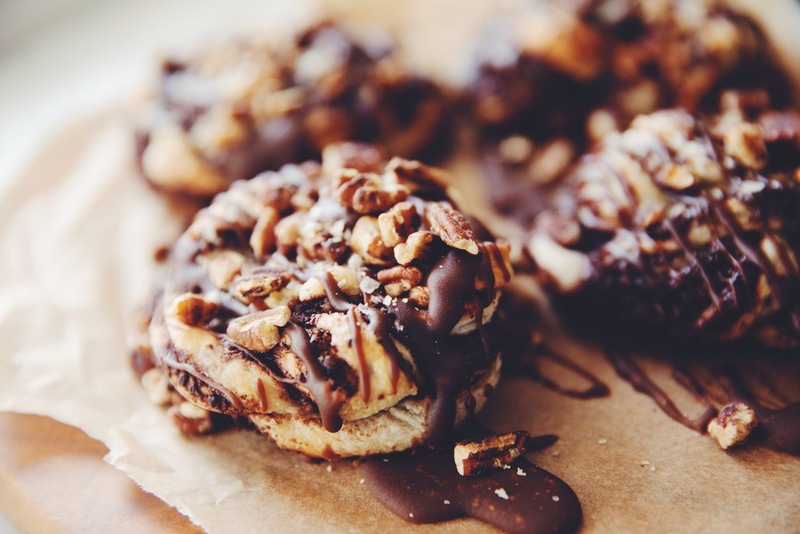 I’ve had rave reviews for the salted caramel apple crumble tart as well as the caramel pecan cinnamon rolls… so naturally I had to use the same flavors and components in this sweet danish recipe for salted caramel dark chocolate danishes. Y’all were shook over the savory danishes that went up last week, so I hope you’re stoked to sink your teeth into these sweet thangs! There’s also a recipe for sour cherry almond danishes with vegan vanilla custard that you can’t miss. 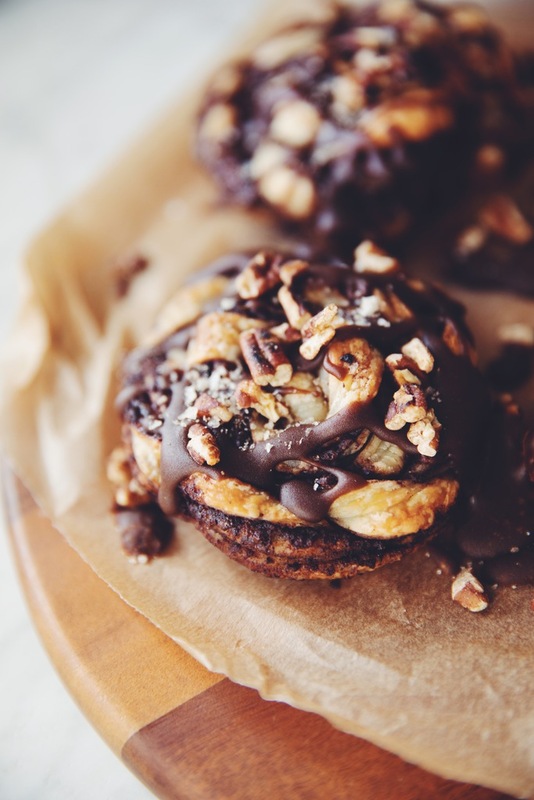 There’s a dark chocolate paste swirled into this pre made puff pastry and it’s easy to do! Watch the video below to see how it all comes together or keep scrolling for the recipe. these vegan salted caramel dark chocolate danishes are the ultimate sweet and are easy to whip up with premade puff pastry! In a food processor, blend the dark chocolate chunks until they are ground into smaller pieces, about the size of quinoa. Add in vegan butter and blend until a smooth paste forms. You may need to scrape down the sides of the food processor intermittently. To prepare the puff pastry, lightly flour a clean work surface. Divide the dough in half and work with a half portion at a time, and refrigerate the remaining half to keep it cold. Use a rolling pin to roll out each half into a 8 x 10-inch rectangle. Take half of the chocolate butter paste and add it into the center of the dough. Use a small offset spatula or rubber spatula to spread it evenly across the dough, but leave a 1/4-inch from the edges bare. Do an envelope fold, by imagining your dough is divided into thirds. Fold the left side of the dough so it covers 2/3 of the dough. Then fold the right side over the left side. Sprinkle a little flour on the surface of the dough and roll it out again to 8 x 10-inches, flipping or turning the dough if needed. On the 8-inch side, mark out every 2 inches where you will cut. Use a knife or dough cutter and a ruler as a guide to help you cut out 4 even strips. Slice each of these strips of the dough into thirds, but leave a 1/2-inch at the top uncut. Braid the strips, while twisting them, and then pinch closed when you get to the end. Now using both hands, pick up the braid and wrap the braid like so it looks like a nest. Tuck the end underneath the nest, secured between one of the layers so it doesn’t unfold during baking. Repeat steps until all the dough is used up. Place the danishes on a parchment lined baking sheet and brush the tops with nondairy milk. Bake for 14 to 16 minutes. Let cool for at least 15 minutes before adding the salted caramel sauce. While the danishes are baking, make the salted caramel by combining the ingredients in a small saucepan over medium heat. Whisk constantly for 4 to 6 minutes as it thickens. Remove from the heat, but keep the caramel in the pot to stay warm, stirring every so often until needed. To toast the pecan pieces, dry toast in a small pan for 4 to 5 minutes on medium heat until they smell nutty. Shake the pan constantly so they don’t burn. Once the danishes are cool, drizzle the salted caramel on top and sprinkle toasted pecan pieces and Maldon salt flakes, if desired. in the video we make 4 danishes, but the recipe is for 8!